It happened again the other day. I have lost track of the number of times I’ve seen an often quite funny image posted on Facebook that is completely ruined for me by the fact that the creator says “lets” instead of “let’s”. How hard is it? “Lets” is the third person singular version of the verb to let. An alternative verb would be to allow. Or the less often used alternative rent. (As in he lets flats.) “Let’s” is, of course, a contraction of let us. As in let us learn the rules. If it helps, think of lettuce. Okay, we don’t contract “let him learn” or “let them learn”, but we do contract let us. It’s (oh, god, don’t let me get started on it’s) a rule. Oh, too late. Now I’m irritated by it’s and its. I see it everywhere and it drives me mad. Many years ago I had a conversation with a younger friend who freely admitted her spelling and grammar were appalling. By the time she got to school in Britain, the rules for both had been thrown out the window. “Don’t blame me,” she said, “ I learnt to spell frenetically.” I burst out laughing and said, “I think you mean phonetically.” She asked what she’d just said and I told her. She asked what frenetically meant and I told her. “Damn,” she said, “no wonder people always laugh when I say that. I thought they were just agreeing that it was a stupid way to teach spelling.” She thought about it for a second, then added, “Actually, it is a good description of how I was taught to spell.” I couldn’t disagree. I suspect, if you’re reading this (oh, no, don’t start on your, you’re, yore), you probably already know the difference between it’s and its. 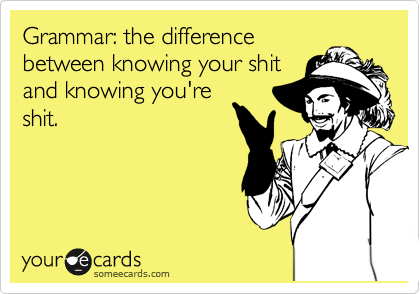 If not, consider this your happily-given grammar lesson of the day. Oh man, I was just reading a post on an fb group that I frequent, just littered with terrible grammar and having a hard time not correcting (fingers were almost literally itching to correct!) when someone else weighed in and the original poster called her “ableist” (well, she spelled it ablist). Eeek.